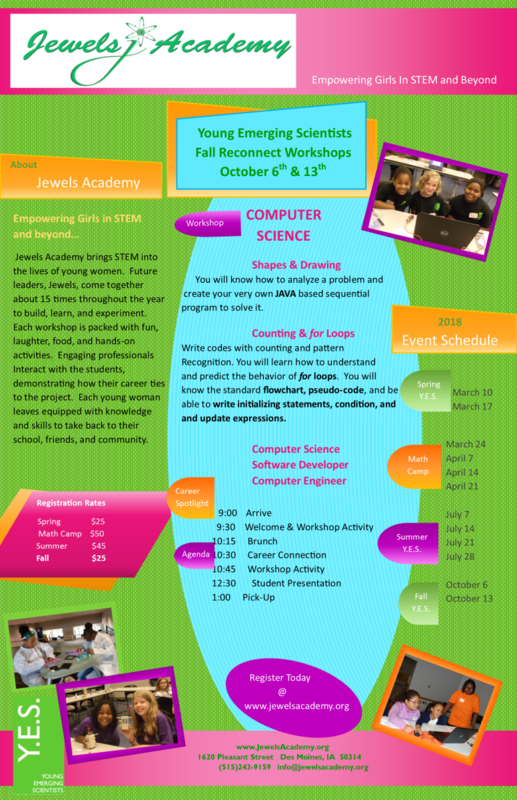 Young Emerging Scientists' STEM Reconnect will be on 10/6 and 10/13 for 4th - 9th grades. We will host two Fall workshops at 1620 Pleasant Street (Mickle Center), Des Moines, Iowa from 9:00 a.m. - 1:00 p.m. The total registration fee is $25 which includes two Saturday workshops and snacks during the sessions. The students will be taught by a past Microsoft Programmer where they will not only obtain hands on programming but also discuss career exploration in computer science. Invite your friends. The workshops will be spectacular!!! Please note that this will be the fee whether your child attends one or all sessions. A light snack will be provided during all workshops. Cost is $25 for both Saturday sessions. A light snack will be provided.